Ever wondered about SCUBA diving, but been afraid you would be "claustrophobic", or didn't want to invest a ton of money in a full class? Here's the perfect opportunity to find out what it's all about and see if it's something you want to do without investing much time or money. Class is limited to 8 (can squeeze in a couple more possibly), but if there is an interest, more dates can easily be added, just let me know! 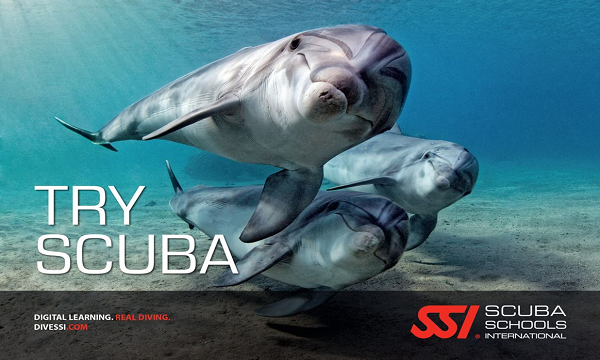 If you also complete the digital online training you will earn the SSI Try Scuba recognition rating. He will do additional sessions if there is interest! We will go for a unch after off-site. Event Summary: Ever wondered about SCUBA diving, but been afraid you would be "claustrophobic", or didn't want to invest a ton of money in a full class? Here's the perfect opportunity to find out what it's all about and see if it's something you want to do without investing much time or money. Class is limited to 8 (can squeeze in a couple more possibly), but if there is an interest, more dates can easily be added, just let me know! $20 and 2 hours is all you need, and the $20 can be applied to an open water certification if you decide to pursue it!